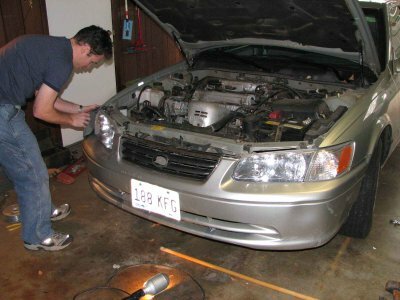 This weekend we visited the Cahill family and while we were there, Brian took some time to repair the damage to our car from hitting some wild hogs. 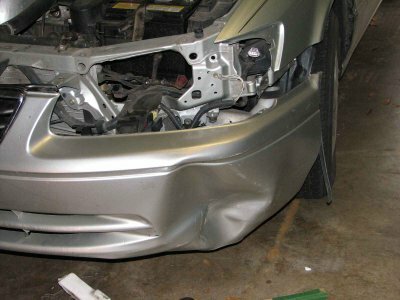 There was a big dent, numerous cracks in the fender and one of the headlights had gone out (a more recent aftereffect ). Brian spent quite some time with Benj. 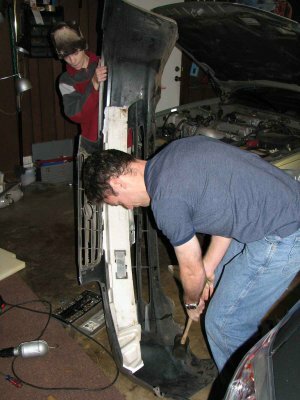 figuring out how to get the fender off. Benj. helped him organize the screws so they could put them back in the right spots when they were done. Brian tried several things to fix the dent but ended up putting it on his knee and using brute strength to pop it back out! 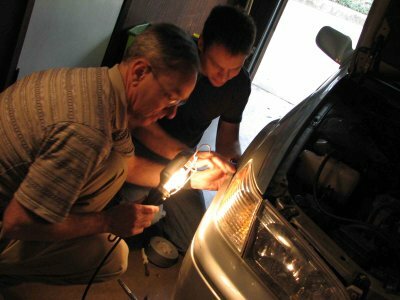 Brian and his dad fix the headlight and put on some finishing touches with duct tape. He fixed the cracks and breaks on the fender with duct tape (how nice that it matches our car ) You can hardly tell if you didn’t know. And here’s the new look! Pretty good eh? 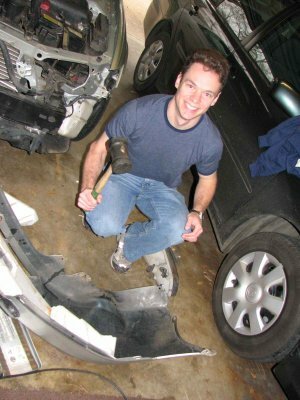 I think Brian spent around $12.00 overall to fix our car. He’s so resourceful and does quality, detailed work. I’m very proud of his ability to do almost anything he sets his mind to. Knowing his personality now, I didn’t stand a chance when he came courting.